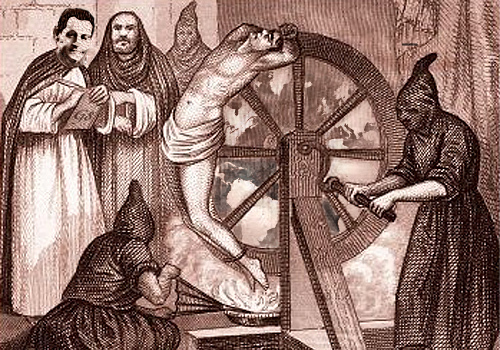 Many on the left have called for a new inquisition, one that seeks to to punish infidels and heretics of one the world’s newest religions, Man-made Global Warming (AKA Anthropogenic Global Warming or AGW). When a handful of Marxist professors, 20 in all, got together to request the White House prosecute “deniers” under the RICO statute it was rightfully seen as act of the lunatic fringe. They were far fewer than the 1000 that signed on as dissenters to AGW dogma in 2010, but their outlandish demands made the news. Unfortunately, what most would consider laughable demands have been taken to heart by some. It appears prosecutions of “deniers,” or more appropriately called the left’s AGW inquisition movement, is now underway. The first such case is now winding its way towards the courts. In an insane act of scientific and legal ignorance, the state of New York has announced it is investigating oil giant Exxon for making “misleading statements” regarding Climate Change. The investigation by the New York Attorney General (Eric Schneiderman) is examining statements by Exxon Mobil and Peabody Energy to determine whether they deceived investors about the causes and impacts of climate change. In other words, the thought police are using government intimidation to try to punish those who do not agree with them. Exxon, of course, makes a fitting first target. Being still closely associated in the public mind with the Exxon Valdez oil spill, it is represents to the left Big Oil at its worst. Using the power of the New York state government, the Attorney General’s office is obviously hoping to use the oil company as a stepping stone towards a more generalized prosecution/inquisition of those who do not follow the faith. In a world where Christians are already under fire for following their conscience, even being fined and threatened with jail time if the fail to provide services for so called gay marriages; it was only a matter of time before such religious prosecutions expanded to include skeptics of Man-made Global Warming as well. In the liberal quest for power and control, AGW offers them what can only be called their Holy Grail. By controlling CO2, and by default the access to energy, the liberal establishment has the ability to direct the world’s wealth to wherever it wants. This of course gives the left goosebumps. This is not to say that there is some vast left wing conspiracy, there is merely a world wide recognition of the potential AGW has for giving the left the power it has always dreamed of having. The Global Warming religion is merely a means to an end whose potential has become uniting force for left wing ideologues. While using obscure corporate and security exchange laws to prosecute Exxon for not bowing to alarmist demands is deplorable, it is also not surprising. The more the evidence has piled up against them, the shriller the alarmists have become. The panic by some is certainly due to their buying into the alarmists claims, but for many it is the sheer horror of losing this opportunity for control that drives them to start foaming at the mouth. The alarmists greatest weapon for now has been ignorance. They could make outlandish claims of Florida going under water in the near future, mega-storms devastating the planet or even Greenland being ice free with impunity for awhile. The problem for them is time is not on their side. The time table for many of their wild claims has come and went. Additionally, with basically two decades of satellite data showing no warming, the occurrence of storms actually decreasing and many predicting a period of global cooling around the corner, the movement is becoming victims of their own over-the-top rhetoric. Like a cornered and wounded animals, the alarmists are becoming more dangerous. Wherever they have power, and the ability to abuse it, there is potential for them to do harm. Attorney General Schneiderman may be the first to go down this road, but he is likely far from the last. Others are likely watching and studying his actions to see if they can successfully go down a similar path. In additions to wayward corporations, professors of sanity who do not tow the line on AGW may soon find their tenured positions in peril, bloggers and other non-traditional media might see access to the internet cut and a host of other actions could take place. The liberal establishment has no limits, morale or otherwise, to what it is willing to do to expand its power. Given AGW’s power centralizing potential, they will not let it go down without a fight.